Margot was born with a trowel in her hand and has no intention of ever putting it down. Unfortunately, it wasn’t until she took Master Gardener courses 20 years ago that she realized she should have pursued a career in horticulture rather than teaching. The Master Gardener manual inspired Margot to design a perpetual garden journal called ‘My Growing Gardenbook’ which has sold over 8000 copies across Canada and the US in garden centres and gift shops. 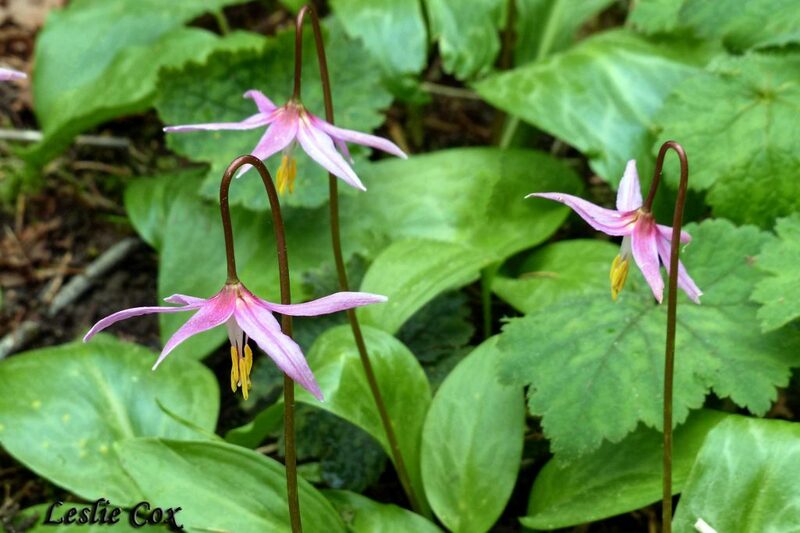 Her particular interest in native plants began early as she explored the woods near her home in (then rural) Burnaby and has contributed to her preference for natural-looking landscapes. 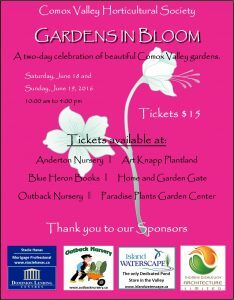 Gardens in Bloom is a two-day, self-guided tour celebrating ten beautiful gardens in the Comox Valley. When June and Gord viewed their current property thirty-seven years ago, they knew right away it was the place for them. All it had was an ugly mobile home, an unfinished workshop, and a grassy area. Their dream was to build their own house, and put in a garden. Since June worked at Farquharson Farms, she had great exposure to a wide range of plants. Luckily, June and Gord’s property has a good supply of water, and with the surrounding woods it is sheltered from weather extremes. Who says Merville is in a “cold belt”? There is a ten foot tall windmill palm on their property! The original soil was very rocky but copious amounts of compost has been added over the years and the rocks removed so things are growing well. Those rocks have made great edges for the garden beds. June and Gord’s garden consists of large rhodos, shrubs, fruit trees, and a fenced vegetable area. They have had to co-exist with the deer and the occasional bear. The stick ‘teepees’ around some small plants are from last spring, when they got their newest dog. However, he has not mastered his garden manners quite yet! June and Gord’s latest project was to have a large pond installed last fall. So named ‘Farquhar’s Brook’, they have begun to plant around it. Next, there is a gazebo in the plans! June thinks this will round out their garden quite well. About half of their 3.5 acre property is still a natural woodland. This diminutive third of an acre, nestled in the heart of rural Black Creek, began a make-over in 1999 when both Leslie and John were presented with an unexpected career change. Four teenagers meant growing food was necessary, so they embarked on expanding their production and set up a table at the local Farmer’s Market. Growing Concern Cottage Garden was born. That was also the year when Leslie finally got her herb garden. John was enchanted. Ornamental plants and garden design became a passion. Every year, more lawn in the backyard was taken over by mounds of soil, and planted with a variety of perennial Leslie grew from seed. Plant sales were a special treat for the treasures they would often offer up – at prices in keeping with the new budget. Once the backyard was up to snuff, Leslie announced the front yard needed a make-over. It was to be her garden. There could not be two captains on the ship, and John already had the back garden. Growing Concern Cottage Garden has evolved to become an intensely planted landscape – filled with an eclectic assimilation of horticultural materials, numbering over 1500, which create waves of altering delights throughout the growing season. Almost no two weeks are the same. 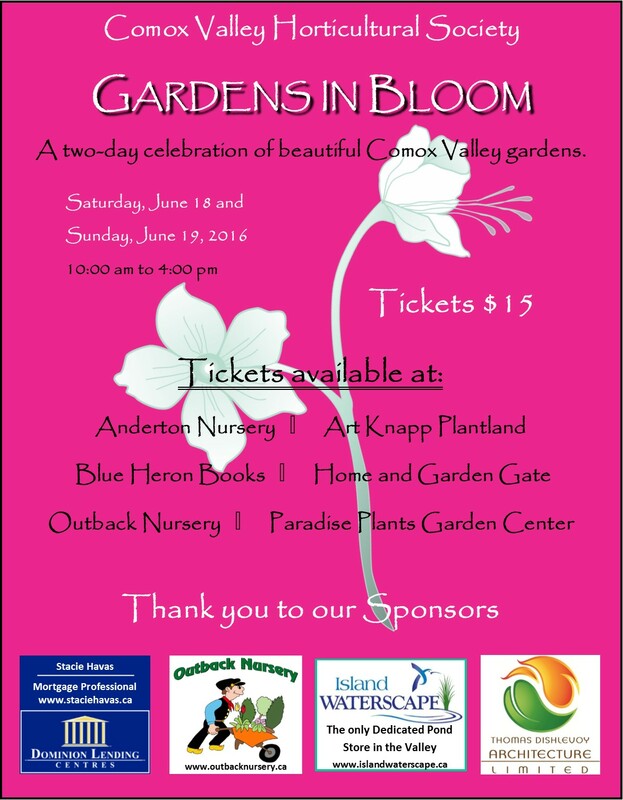 All CVHS members should have received an email notice on May 10th, 2016, noting the address and directions to these two Open Gardens. If you need further information for this tour, please contact the Coordinator: gardentours@comoxvalleyhortsociety.ca on our Contact Us page. You will be delighted by Lauren’s garden, which is constantly evolving with new and re-invented projects. 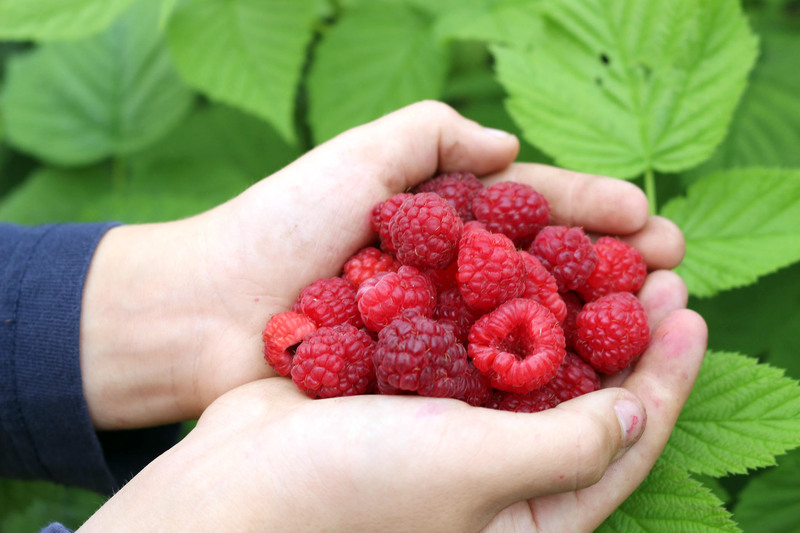 As Lauren says, “I hold true to the urban permaculturist principle – I eat from my garden. 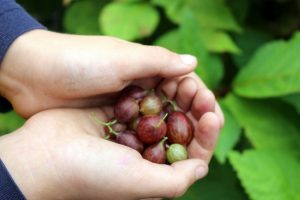 My goal is to create a food forest and to have it self-tending and regenerating.” Lauren is often surprised by what comes up in her garden and what creatures are lurking within it. While her garden could appear a bit disorderly to some, it is as nature intended and there are no straight lines. Come out and experience this “Urban Farm”. All CVHS Members should have received an email notice on April 29th, 2016, noting the address and directions to this Open Garden. If you need further information for this tour, please contact the Coordinator: gardentours@comoxvalleyhortsociety.ca on our Contact Us page. Dianne will be giving a slide presentation on some wonderful types of small fruits to grow in our gardens, and sharing valuable information on how to grow them. Her first recollection of gardening dates back to age 4, helping her mother sow pea seeds in the vegetable garden. And so began her learning experience on the importance of gardening, gradually understanding being a gardener is more than a simple hobby, it is a way of life. Lucky for her, her parents nurtured her budding gardening career and built her a greenhouse when she was still in grade school. During the mid ‘80s, Dianne and her mother joined the Langley Garden Club. Here she blossomed further, garnering more knowledge about plants and gardening, and at the same time, sharing her passion for her garden with like-minded people. All of this passion led Dianne into continuing her education at the university level, undertaking a major in microbiology with a minor in botany. Following graduation, she was thrilled to join the team at Van Noort Bulb Company’s head office in Langley, B.C. where she currently is the Manager of Marketing and Packaging. Van Noort Bulb Company is a wholesale supplier of spring and summer flowering bulbs, perennials, small fruits, shrubs, and roses to garden centres, growers, and landscapers across Canada. 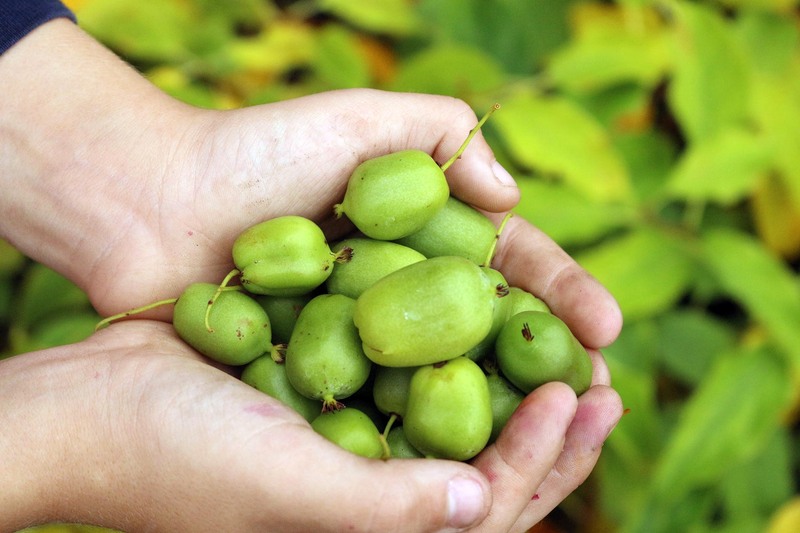 We are very fortunate Dianne will be bringing some of the small fruit plants to our meeting this month. If you love your fruits, you will not want to miss this sale and presentation.